Bildhauer und Zeichner (1898–1986). Eigenh. 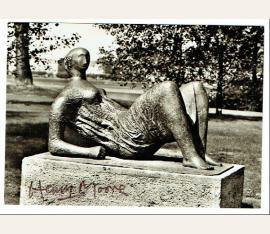 Widmung mit U. in: Henry Moore 1961–1971. Staatsgalerie Moderner Kunst München.1. Oktober bis 21. November 1971. München. Vortitel, 72 SS., 3 Bll., 21 Bll. (Anzeigen), 1 w. Bl. Bedr. Orig.-Broschur. Gr.-4to. 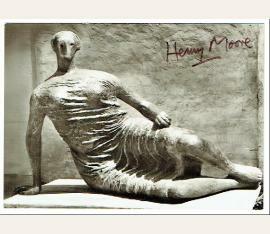 Henry Moore (1898–1986), Bildhauer und Zeichner. 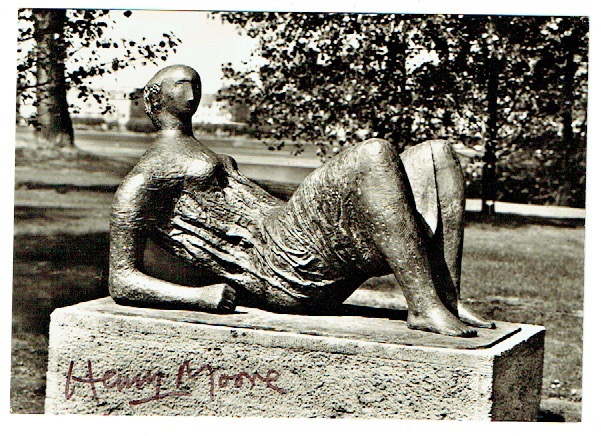 E. Widmung mit U. in: Henry Moore 1961–1971. Staatsgalerie Moderner Kunst München.1. Oktober bis 21. November 1971. München, Staatsgalerie moderner Kunst München, 1971. Vortitel, 72 SS., 3 Bll., 21 Bll. (Anzeigen), 1 w. Bl. Bedr. Orig.-Broschur. Gr.-4°. 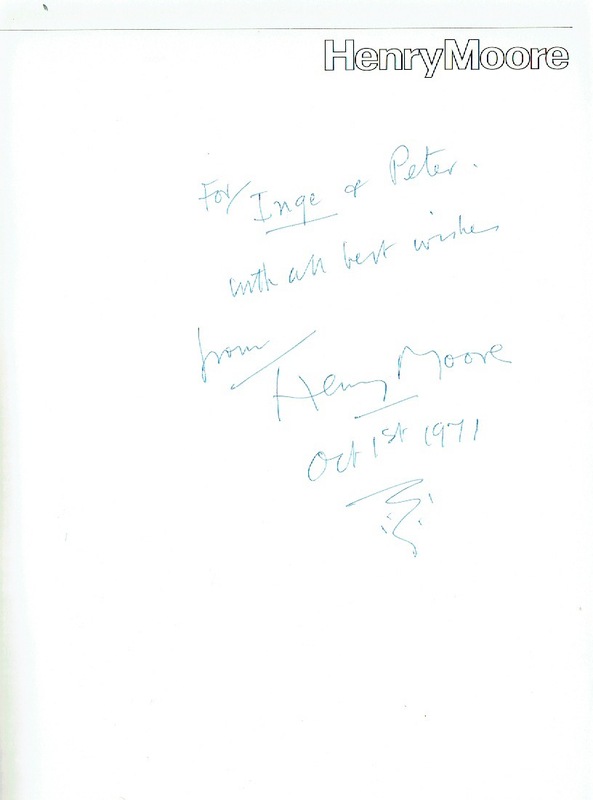 – Der Vortitel mit e. Widmung „for Inge + Peter with all best wishes from Henry Moore | Oct 1st 1971“. – Peter Ade (1913–2005) war Ausstellungsorganisator und langjähriger Leiter des Münchener Hauses der Kunst; seine Gattin war die Schauspielerin Inge Langen (1924–2007). – Der Umschlag etwas lichtrandig, sonst wohlerhalten. – Beiliegend ein Zeitungsausschnitt. English sculptor and artist (1898-1986). Art postcard signed n. p. 150 : 100 mm. 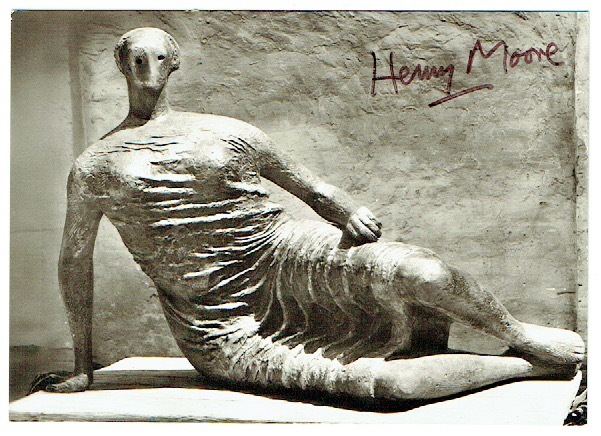 The postcard shows Moore’s work „Weibliche Gewandfigur“ from 1957/58. Signed on the picture side. 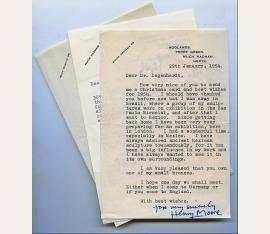 The postcard shows Moore’s work „Liegende“. Signed on the picture side. English sculptor and artist (1898-1986). 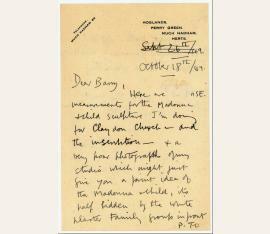 Autograph letter signed ("Henry"). Hoglands, Perry Green, Much Hadham, Hertfordshire. 8vo. 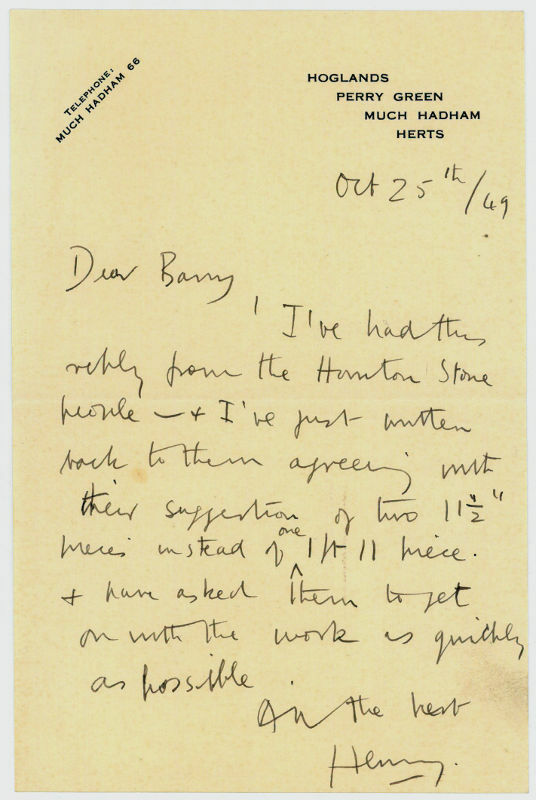 1 p.
To his friend and former teacher Barry Heart: "I've had this reply from the Hanton Stone people - & I've just written back to them agreeing with their suggestion of two 11 ½" pieces instead of one 1 ft 11 piece & have asked them to get on with the work as quickly as possible [...]". - With printed address. English sculptor and artist (1898-1986). 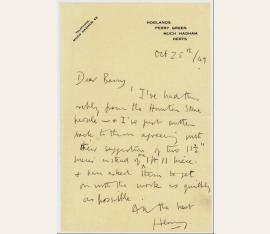 Autograph letter signed ("Henry"). Hoglands, Perry Green, Much Hadam, Herts. 8vo. 2 pp. 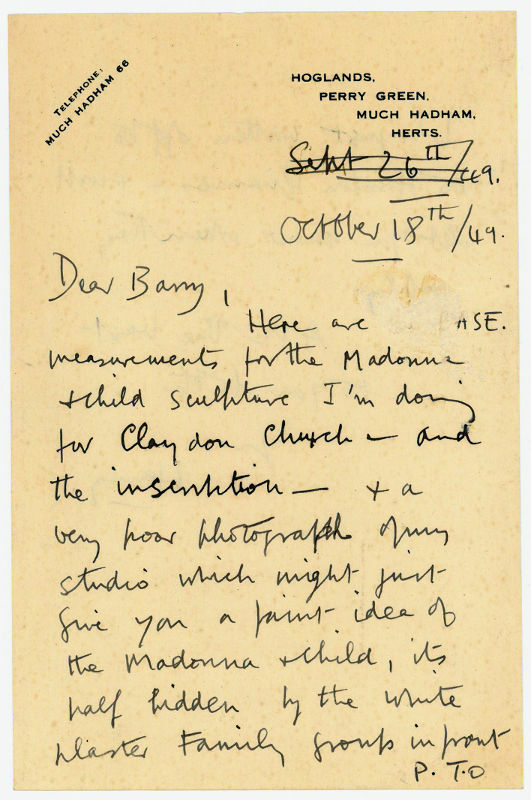 To Barry Hart: "Dear Barry, Here are [the BASE] measurements for the Madonna & child sculpture I'm doing for Claydon Church [...] & a very poor photograph of my studio which might just give you a faint idea of the Madonna & child, it's half hidden by the white plaster Family group in front [...]". - Slight abrasion with loss of a few words. 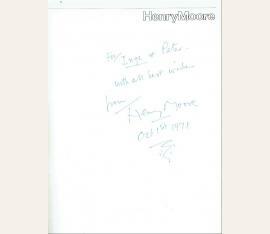 Henry Moore (1898-1986), Bildhauer und Grafiker. Brief m. e. U., Hoglands, Perry Green, Much Hadham, Herts., 15. Januar 1975, 1 Seite gr.-8°. An den Kunsthistoriker Siegfried Salzmann (1928–1993): “[…] Thank you very much for the three photographs which I am very pleased to have. I am happy to report that David Mitchinson (with the Fischer Gallery) has got together the full set of graphic work for Duisburg, except for a few which are completely impossible to find, - and some otherswhich will be forthcoming later. 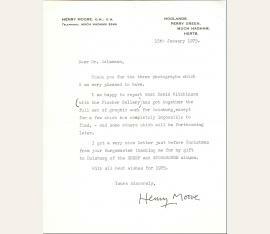 I got a very nice letter just before Christmas you’re your Burgomaster thanking me for my gift to Duisburg of the SHEEP and STONEHENGE albums. […]” – Siegfried Salzmann war von 1971 bis 1984 Direktor des Wilhelm Lehmbruck-Museums in Duisburg und anschließend bis 1993 Direktor der Kunsthalle Bremen. To the art critic Bernhard Degenhart (1907–1999). The first, in part: “I am of course delighted that you like my work enough to buy this small figure. You ask how many casts there are of the Reclining figure (pearl no. 1) 1952 which you have purchased. There is an edition of seven of this figure and one artist’s copy.” The second, in part: “I was away in Brazil, where a group of my sculptures were on exhibition in the Sao Paulo Biennial, and after that I went to Mexico…I have always admired ancient Mexican sculpture tremendously, for it has been a big influence in my work and I have always wanted to see it in its own surroundings.” The third thanks Degenhart for “the little book on Furtwangler.” In overall fine condition. A fine collection of letters with excellent artistic content.